“If a Swedish Lapland interest list had only one item, what would it be?” we asked. Our new young friend didn’t hesitate: “Moving Kiruna,” he replied. We had no plans to go to Kiruna. In fact, we’d never even heard of it. But, as full-time international travelers, we’ve learned that we should trust. Over the past four years, the Universe has routinely delivered us the stories we’ve needed to tell and the places we’ve needed to see. At times, this has been kind of embarrassing; we realize how much we have to learn. 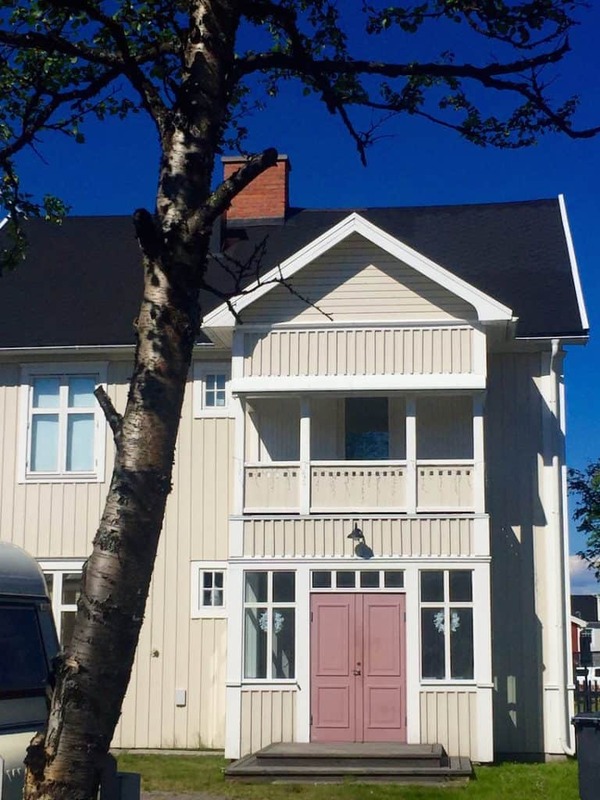 Moving Kiruna? What was that all about? The young dockhand who was so sure we should forsake all the other destinations in Swedish Lapland for Kiruna had never been there himself. Still, we listened. Turns out he had another job besides tying up boats in the Stockholm archipelago. The architectural firm where he worked had won a significant contract: to design an entirely new city high above the Arctic Circle, adjacent to an old one before it collapsed into the iron mine below. They were in charge of moving Kiruna. 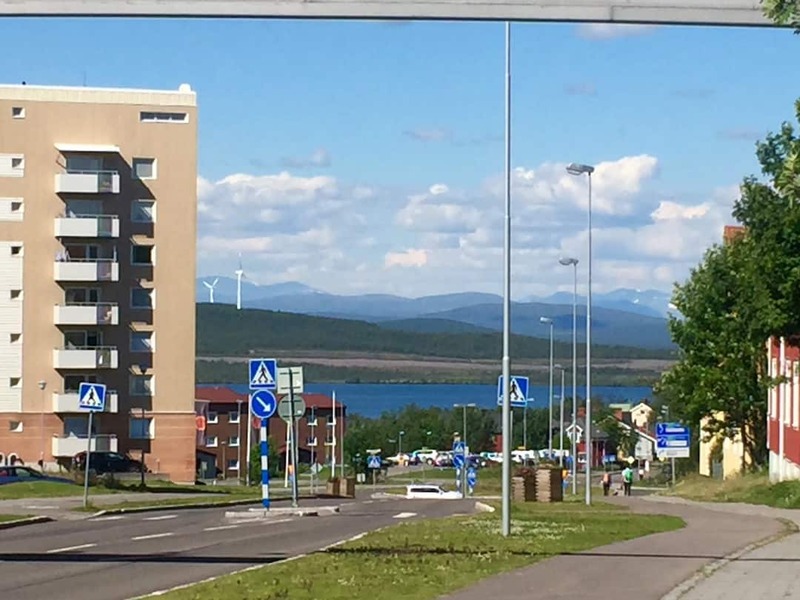 Kiruna (pronounced KEER-ooh-nah, not Keer-OOH-nah like we thought) lies about 90 miles north of the Arctic Circle in Swedish Lapland. We were excited to go there simply because of its location. 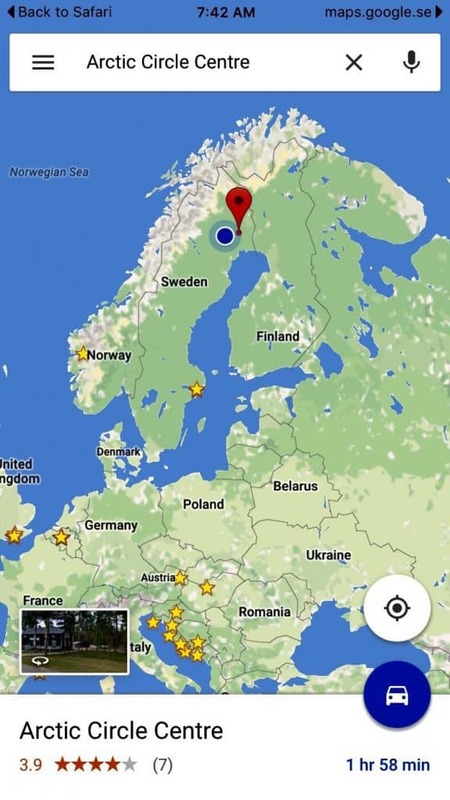 Kiruna would be the northernmost place upon which we had each set foot, so that was a first. 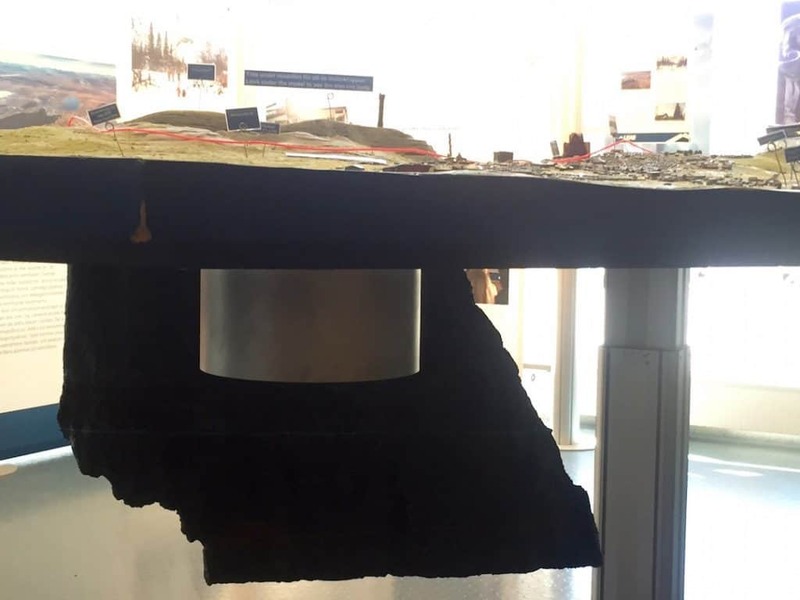 We were also very intrigued that the city was in danger of collapse. As it turns out, that’s a big part, but not the only part, of the story. 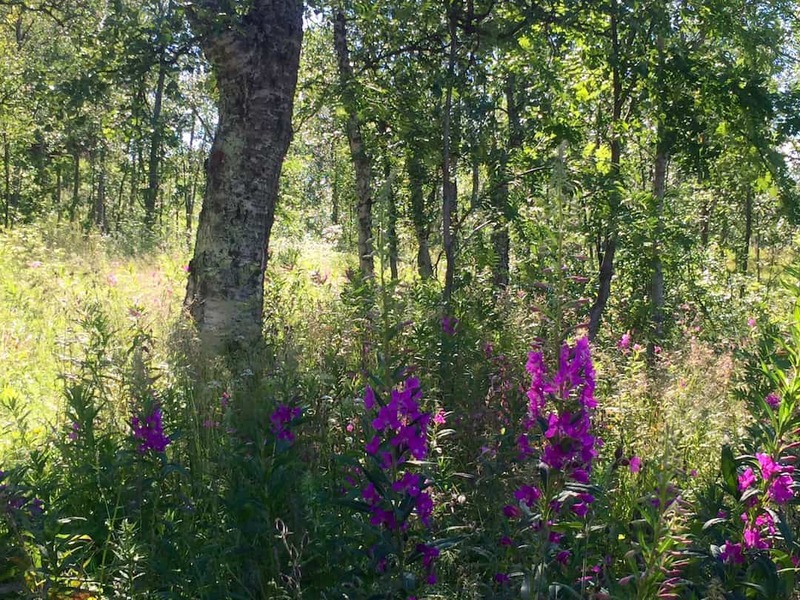 Humans have lived around Kiruna for at least 6,000 years. 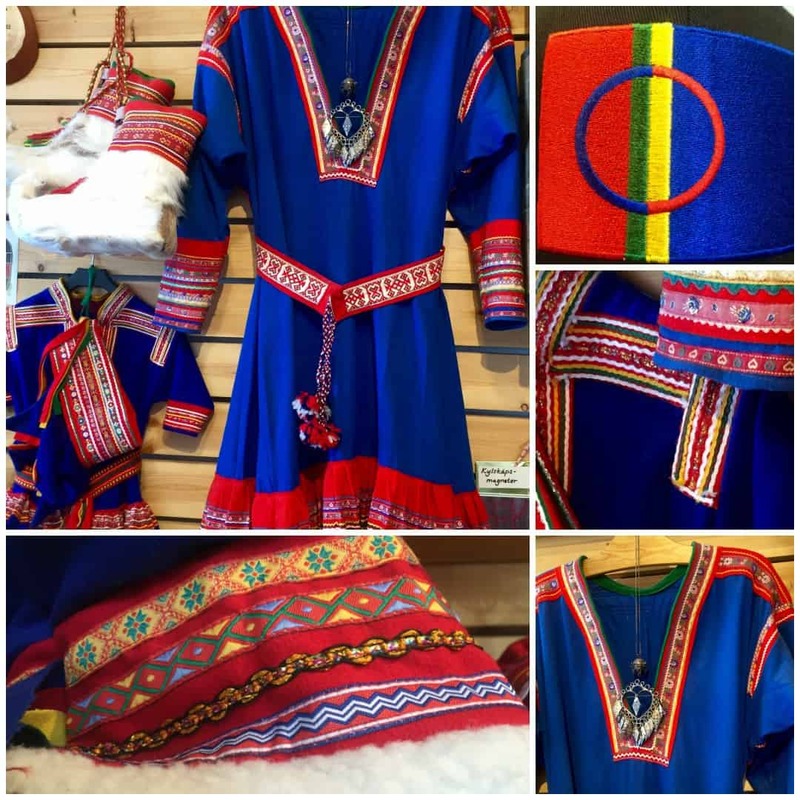 The indigenous Sami people of today appear to be descendants of Paleolithic and Mesolithic hunter-gatherers, due to similar decorative patterns in their craftsmanship. The Sami people are nomadic, wandering a region that encompasses the northern-most latitudes of Norway, Sweden, Finland and a bit of Russia. 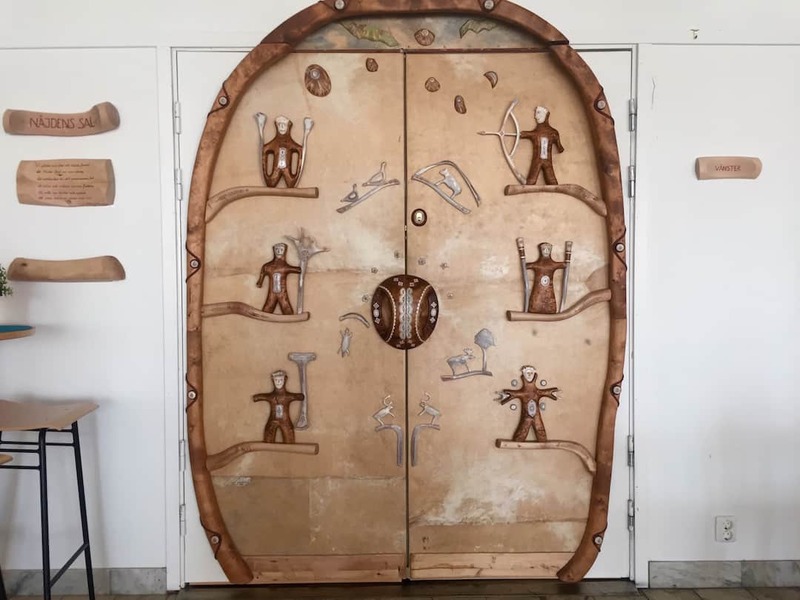 While the presence of iron ore was well-known to the Sami over the centuries, the first organized efforts to access and process the rich resource in Kiruna only came in the 19th century. These were hit and miss: extraction had to occur during the summer, and transportation needed to wait until winter, using reindeer and horse-drawn sleds. Product quality was poor. Even though the railway concession of 1884 allowed a line from Luleå to Narvik (Norway) through Kiruna, political and logistical complications delayed its build until 1898. Kiruna got rail in 1899, but the entire line wasn’t opened until 1903. 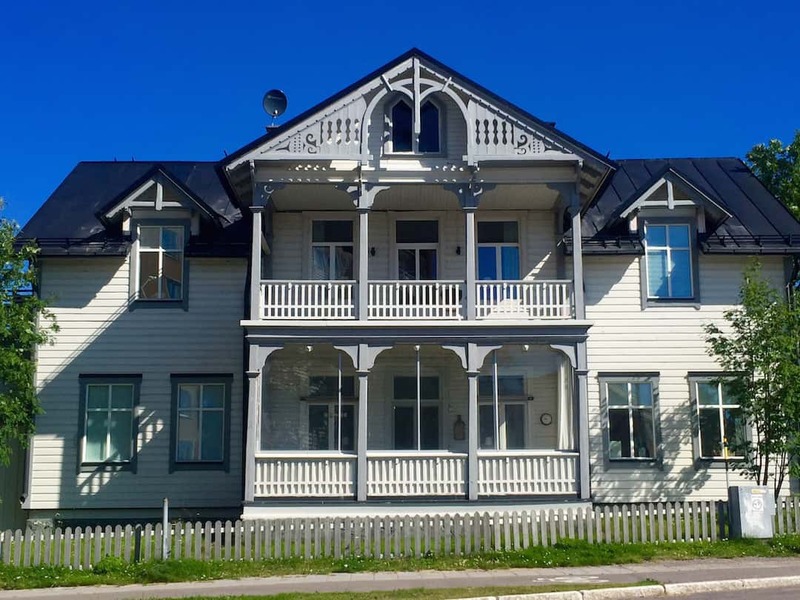 Kiruna’s population grew from 18 in 1899 to almost 13,000 by 1930. 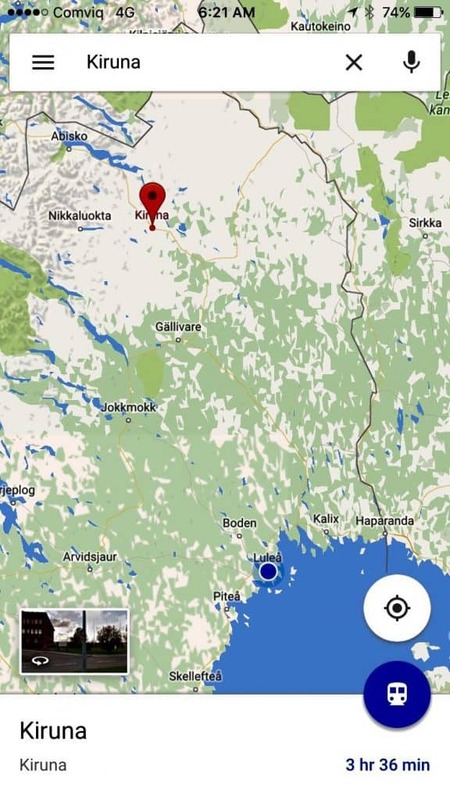 We traveled on the overnight Arctic Express train from Stockholm to Luleå, on the Gulf of Bothnia. 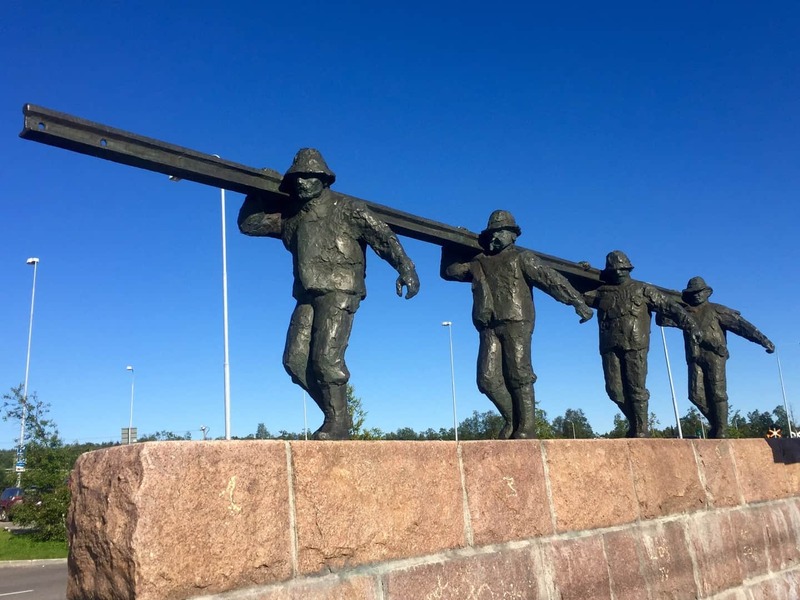 Luleå (pronounced LEW-leh-oh), the capital of Norrbotten County, bills itself as the gateway to Swedish Lapland. 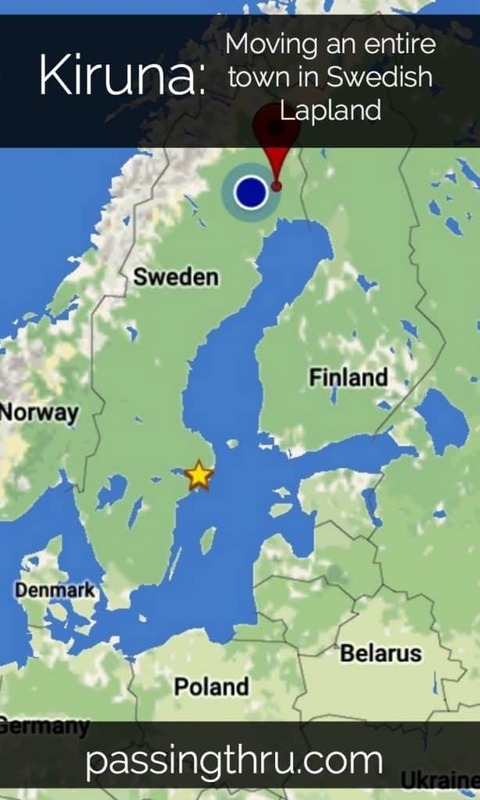 Deciding to headquarter there, we would take the train to Kiruna early the next morning and return in the evening. This made for a long day, but in this part of the world the sun barely sets in late July. Our first glimpse of Kiruna from the new train station was of Kiirunavaara, the mountain containing one of the richest deposits of iron ore in the world. Boarding the complimentary bus to the city center, it was impossible to overlook the mine. 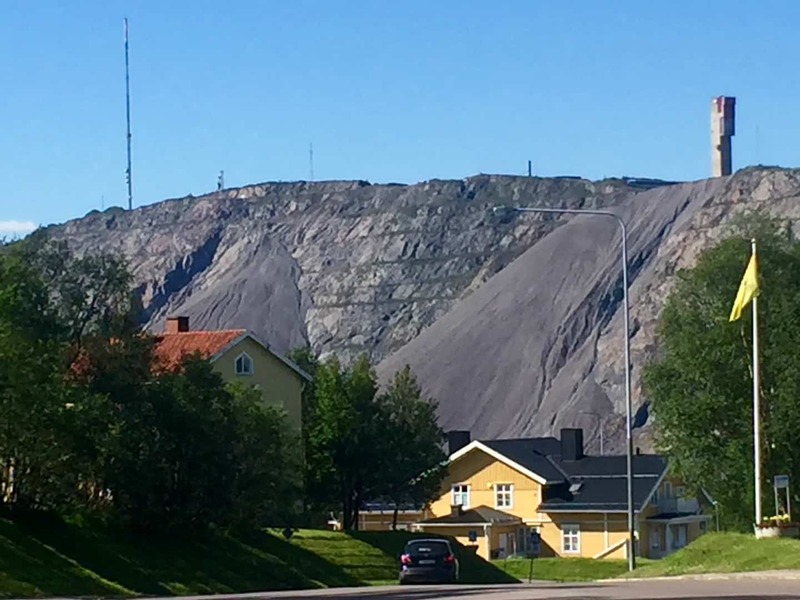 Mining company LKAB, state-owned since the 1950s, extracts the ore here and at Malmberget, processing it into pellets and sinter fines (nodules from dust used in smelting) for transport to Luleå and Narvik (Norway). Exiting the bus in front of the City Hall with its landmark clock tower, we felt disoriented and alone. While the arctic summer sun was bright, there wasn’t a soul around. Climbing up a small embankment, we came to a cluster of historic buildings. They, too, were eerily deserted. Where was everybody, we wondered? Had the residents already been relocated? 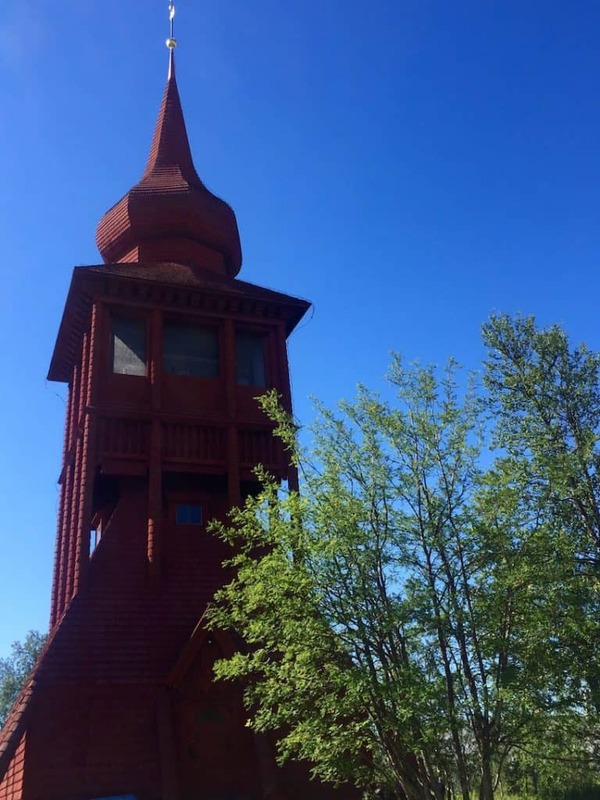 Spotting its spire close by, we remembered that the Kiruna Church was a must see. 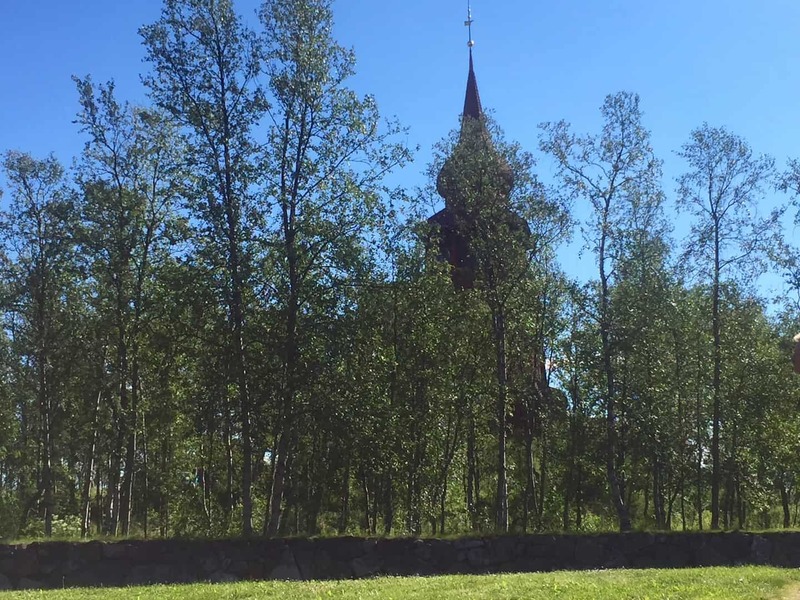 We approached via a dirt path through a natural park-like area, and came upon the reddish wooden tower with the church beyond. 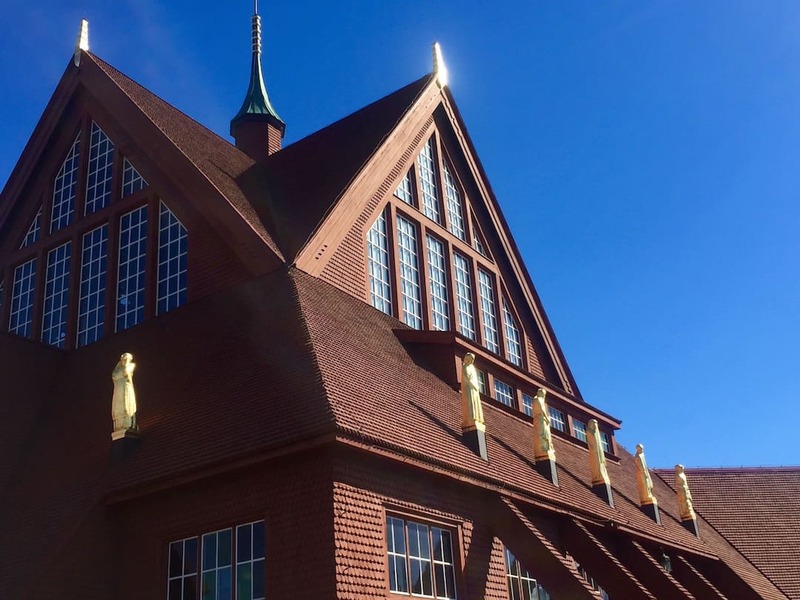 Designed by Gustav Wickman and built in 1912, Kiruna Church seems timeless and contemporary, with large expanses of glass and multiple angular gables. 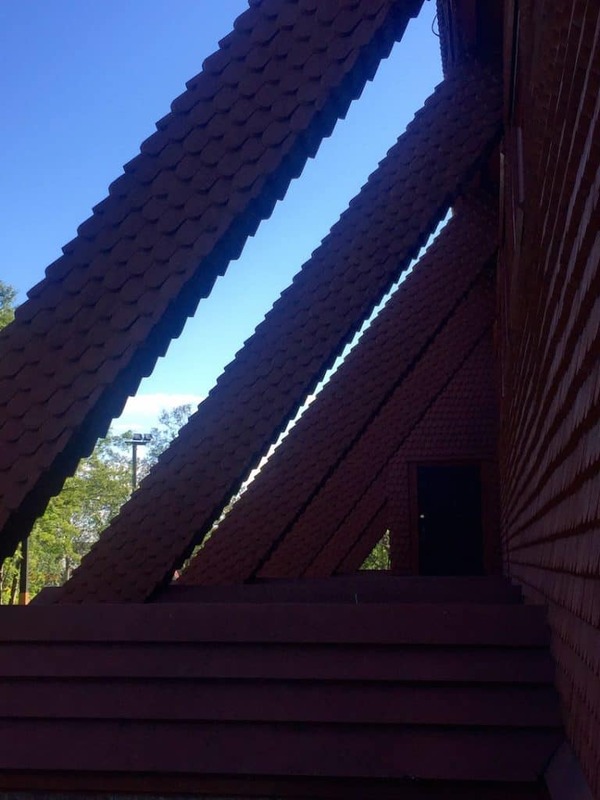 Covered in wooden shingles, the church’s sweeping roof lines were meant to evoke a Sami goahti, the transportable pole structure used up until the 1940s. 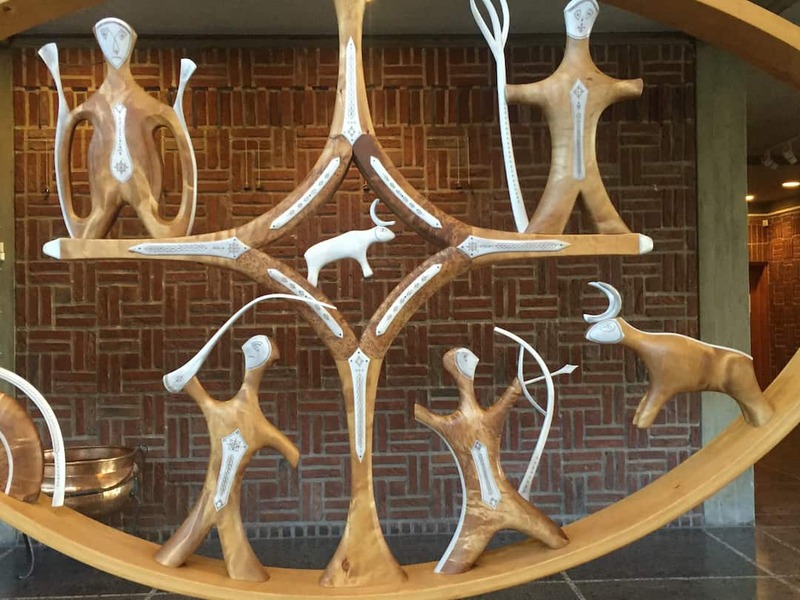 Structural elements of the church’s exterior evoke Sami lodgepoles. The church will be moved in its entirety. The expansive glass in the design illuminates the church interior. 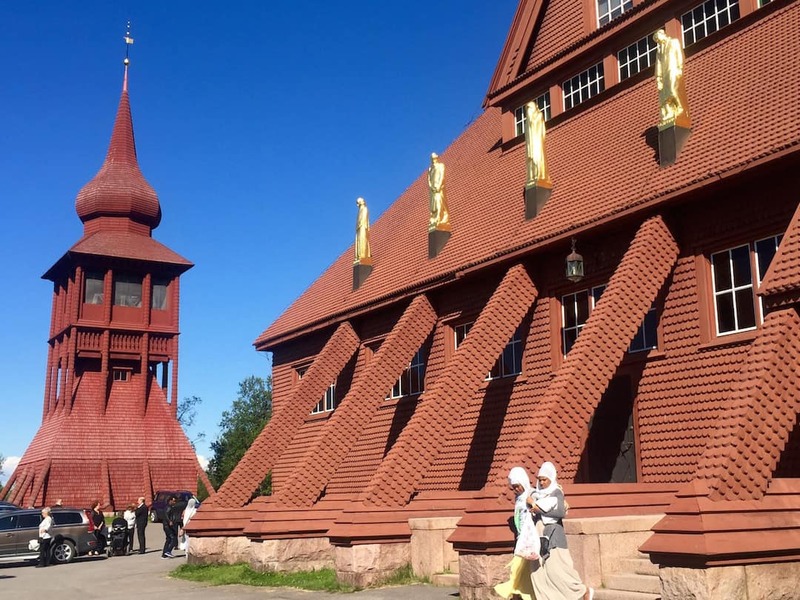 Kiruna Church was voted the most beautiful building in Sweden in 2001. Its Art Nouveau altar was designed by the artistic Prince Eugen. 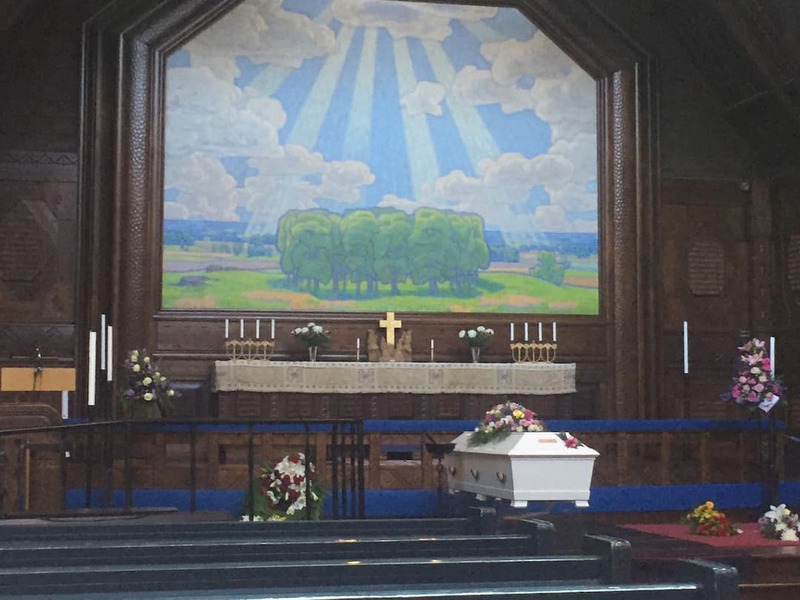 Though our visit was cut short for an impending funeral, the soloist’s practice run added a beautiful dimension. White Architects’ plan involves relocating the entire structure. LKAB transitioned from surface mining to sublevel cave mining in the 1960s to reach greater portions of the original reserve of almost 2 billion tons of ore. The mine’s current depth is just under 4500 feet. 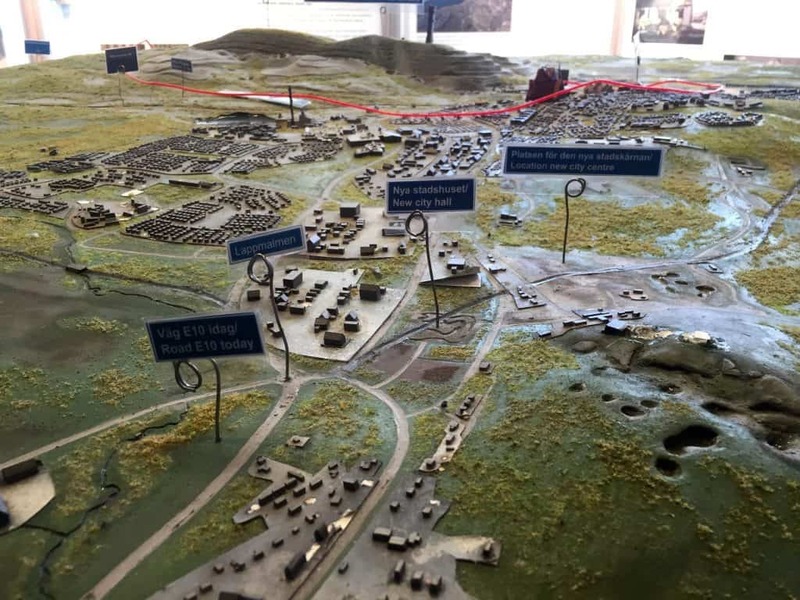 We looked at a scale model of the town on a table top in the Kiruna Visitor Center which had a sub-surface component. It was only then that we realized the full extent of the gargantuan proportions of the mine. The table model displayed a red circular line, within which was the part of town which wasn’t going to make the cut. 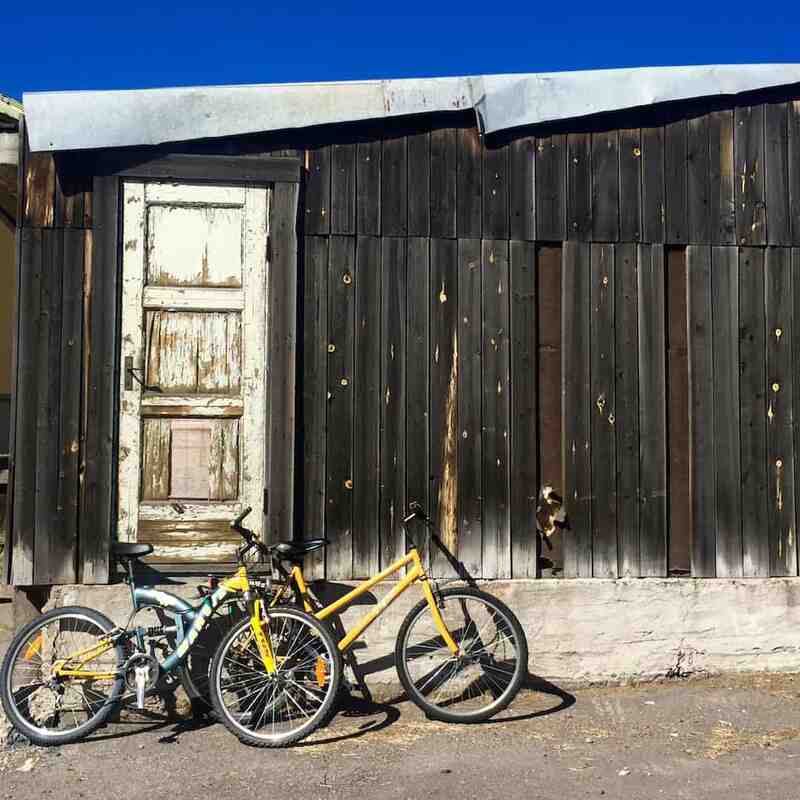 “Moving Kiruna” is kind of a misnomer, we learned. Instead, only 21 buildings will be saved and relocated. The plan calls for relocating people and businesses around a new epicenter. 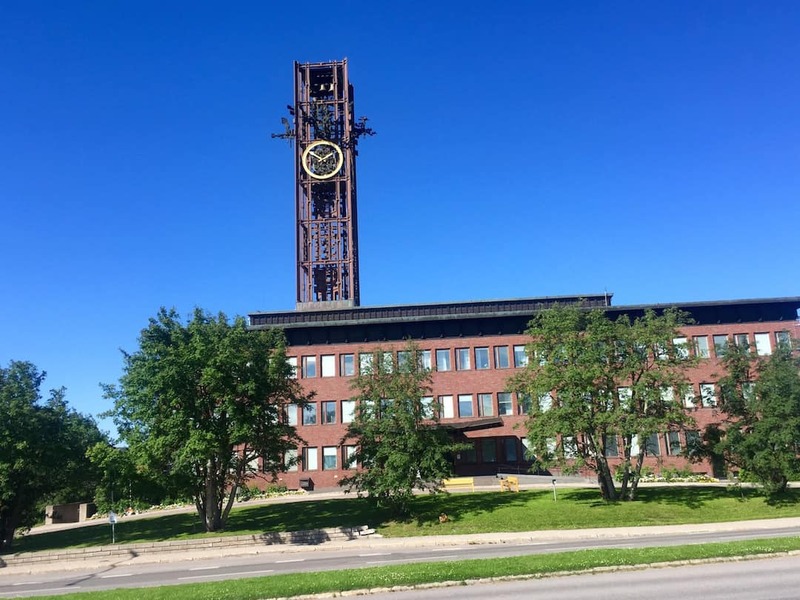 The mine dominates the landscape adjacent to the beautiful city hall, whose clock tower is a symbol of the town. Sadly, the tower is the only part of the building which will be moved according to the new plan. 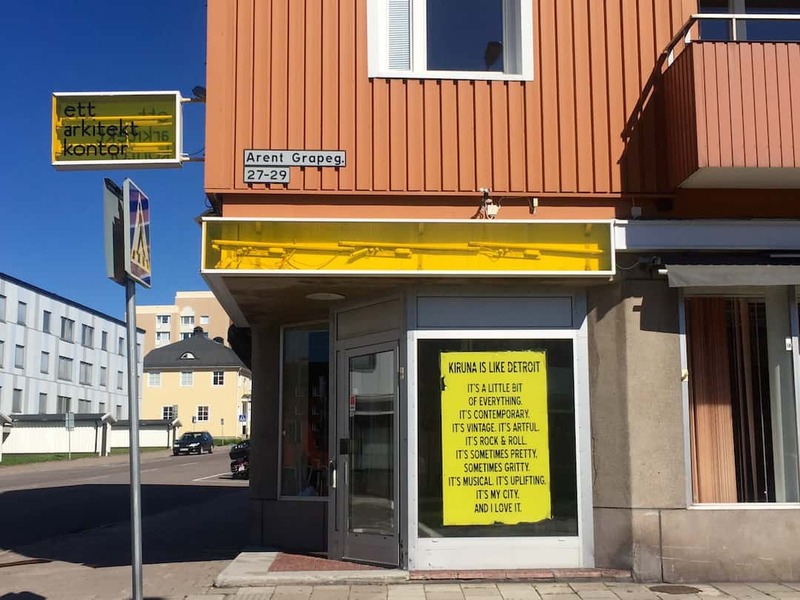 We decided to wander through the older parts of town surrounding the city center to look at the buildings which would eventually be demolished. There was an air of poignancy permeating the narrow, curving streets. Some of the homes were beautifully cared for, and others had fallen into neglect, as if to convey they knew their demise was inevitable. What a stately beauty this neglected manse must have been. White tells us they took the mandate to develop a 20-year relocation plan a long step further. Their master plan of 100 years’ duration calls for a sustainable city with diverse economic strengths, less dependent on iron. 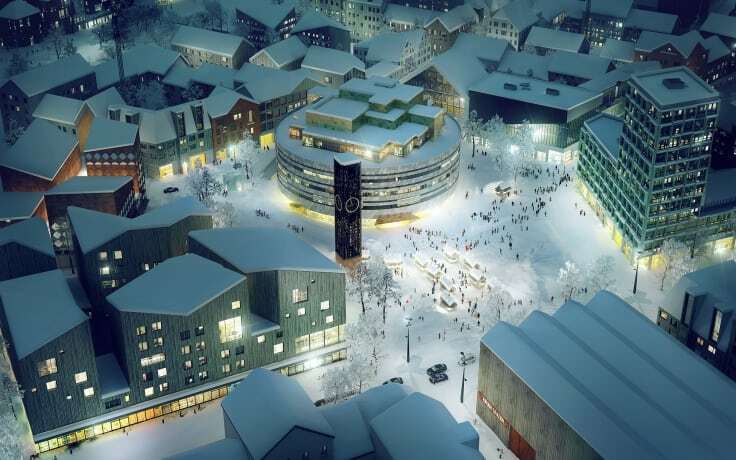 To that end, LKAB will pay €415.5 million for the new town center, scheduled to be completed in 2021. 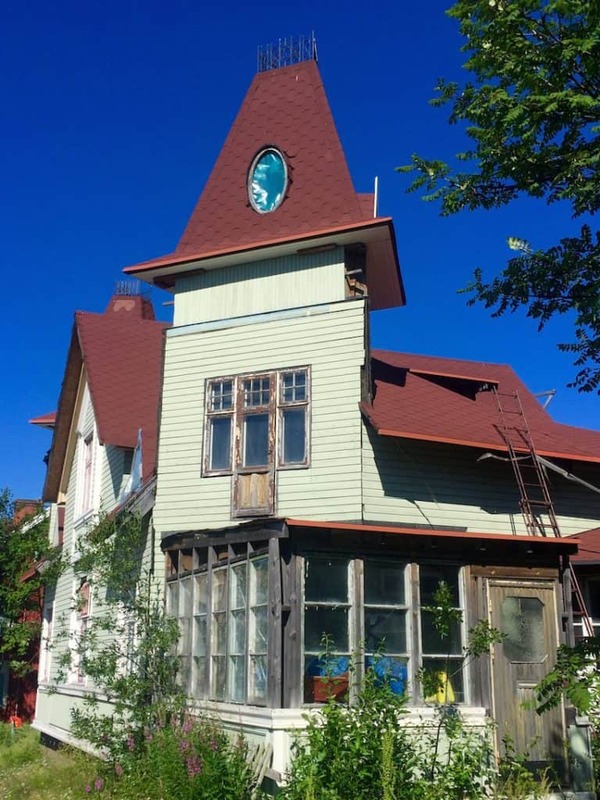 Pieces of old Kiruna will be integrated via the re-use of materials, and certain buildings in their entirety will be relocated. The architects aspire to incorporate these aspects to create intelligent continuity in the transformation. 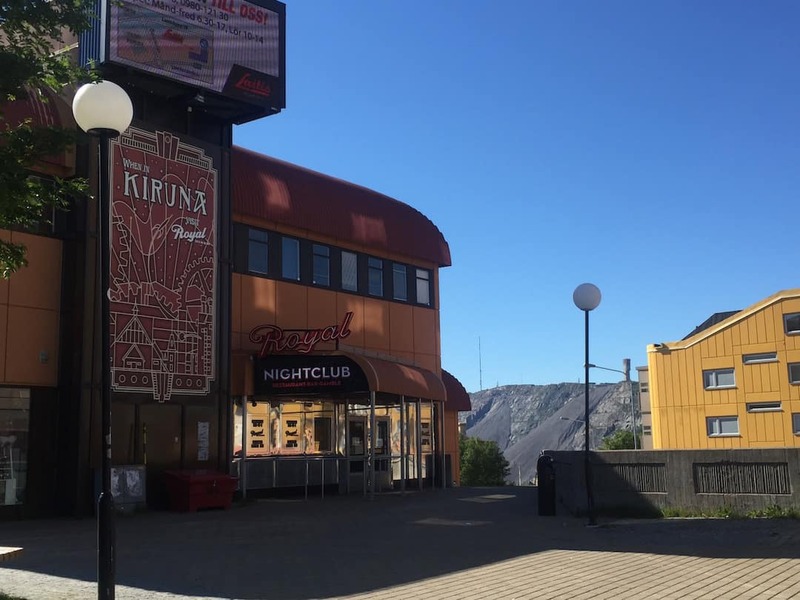 All in all, the comprehensive scope of this plan for moving Kiruna is challenging, not only because of Kiruna’s location which brings severe climate factors into play, but the social elements it must address. 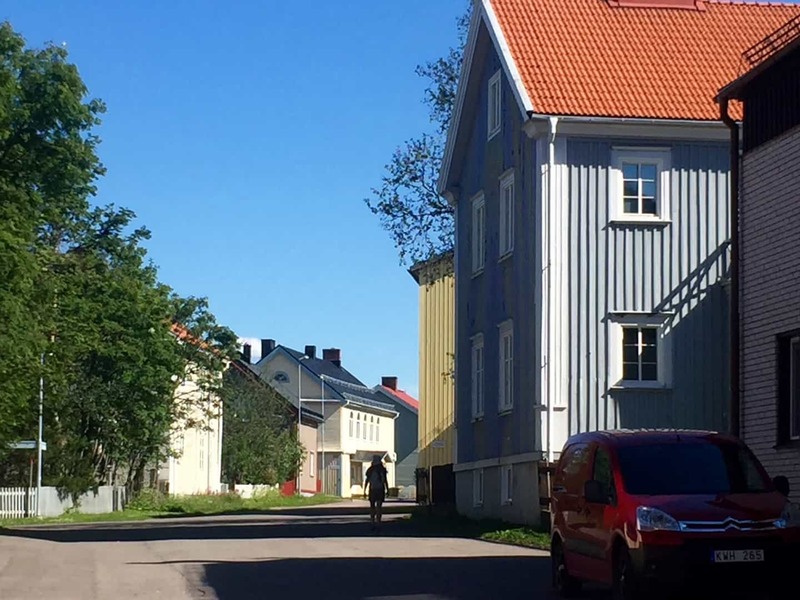 Avoiding displacement and creating the soul of a new Kiruna for its citizens will require cooperation, engagement, and a design which thoughtfully respects the need for community and sense of place. At the end of our visit, we had mixed feelings. We were mournful about the loss of so much history. 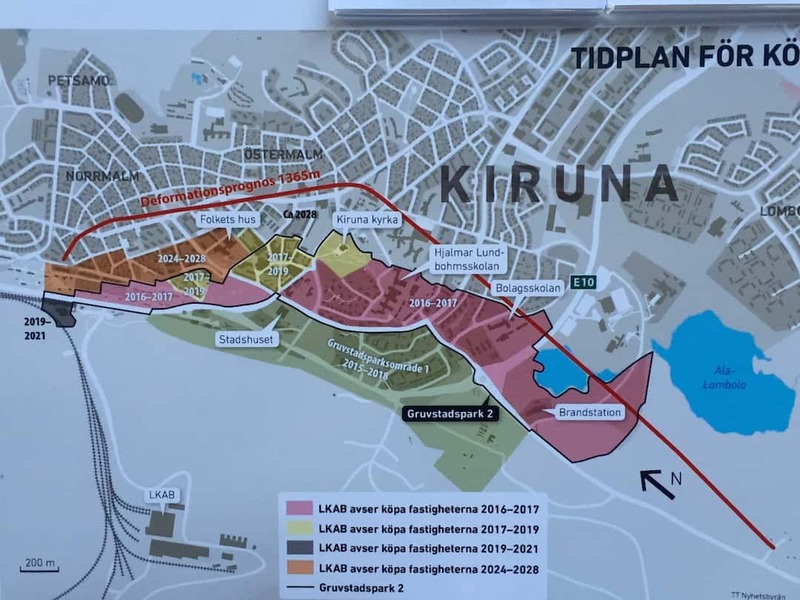 We felt like the plan for moving Kiruna was going to wipe away important elements with very little trace. But we also appreciated that these circumstances provide a wonderful opportunity to inject some personality into Kiruna’s atmosphere, too. 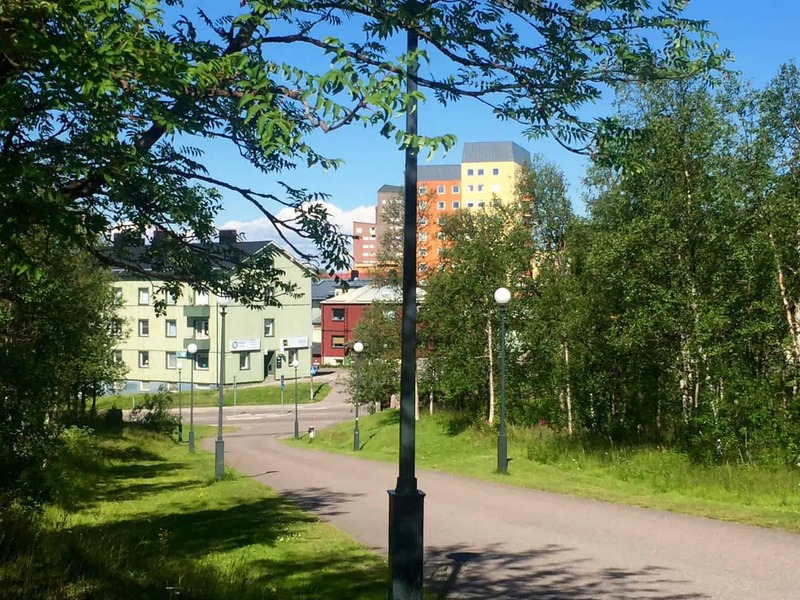 We’d love to revisit Kiruna to observe the progress of this remarkable, and very necessary vision. 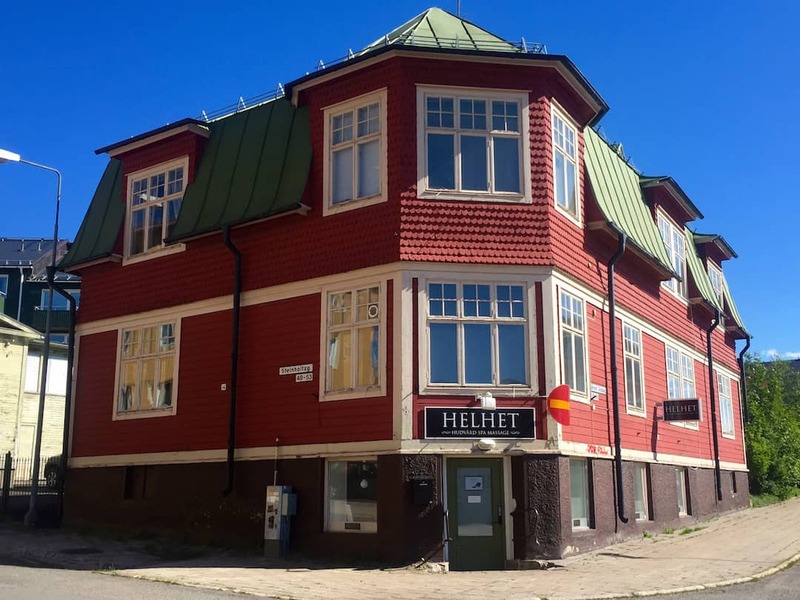 We stayed in Luleå, a 3-1/2 hour train ride from Kiruna, at the marvelous Clarion Hotel Sense (see our full review here). Under normal circumstances, this wouldn’t have been a logistical problem, but then our return train experienced a mechanical failure. We were left waiting in the Kiruna station for several hours and then SJ Railways came through with special bus transportation for us and our fellow passengers back to Luleå. As it was, we had a chance to see “backroads Arctic” in all its midnight sun glory. But we were exhausted, arriving back at our hotel in the wee hours, only to have to depart on another train before breakfast to keep to our pre-arranged schedule. If we were to do this again, we’d arrange an overnight stay in Kiruna.